The Camera Club started with an advertisement in the Dooleys Club magazine “Yours” in January 2005. Terry Kenny had been approached by Heath Ingham, a member of the club and an amateur photographer, about putting feelers out to see it any other members in the club were interested in forming a camera club. The first meeting was held in February, 2005 and it was attended by six people. They were Heath Ingham, Donna Blackbourn, Bob Milojevic, David Miller, Ross Miller and Barbara McGrath. The meeting was presided over by Terry Kenny, who is the co-ordinator of all the inter clubs. The first committee was elected that night with Heath Ingham being nominated as President, Donna Blackbourn as Secretary and Bob Milojevic as Treasurer. Heath remained our President until mid 2006 when at the Annual General meeting Donna Blackbourn was elected President and she remained in that position until she stood down at the A.G.M. in mid 2007. Malcolm Fackender was nominated and was elected President and Donna became the Vice President. Malcolm was President from mid 2007 to mid 2009. David Miller was elected President at the mid year 2009 A.G.M. and continued until 2013. In 2014, Paula Mitchell (nee De Barros) was elected president. The first members of the Camera Club were Heath Ingham, Donna Blackbourn, Mary Deehan, Bob and Jane Milojevic, David Miller, Ross Miller, Doris Giles, Fern Lee, Barbara McGrath, Lyn Keane, Lesley and John Butler. 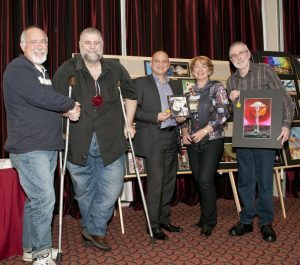 The club ran a couple of small competitions in the beginning which comprised of showing the authors work and having it critiqued by a local photographer, Bob Milojevic or David Miller. Bob and David ran work shops as well at the club or in David’s studio. At that stage the club was only meeting once a month. Our first official competition was on the 12th May, 2006 to which we had eight competitors and our first paid judge, Roy Kessells. Since then we have graduated to two meetings a month comprising of a Presentation/Talk night by prominent photographers and a Competition Night. Our entries have grown from seven competitors in the first years to about fifty regular competitors now. The number of entries has grown from 45 prints to about 200 prints and digital images. The Camera Club included digital images in competition from 13th October, 2006 when Bob Milojevic organized with Dooleys the use of the club’s overhead projector. Dooleys Club has been extremely generous with their rooms and their equipment and has helped the camera club grow to its present position. In return the Camera Club photographers attend the formal functions of the club and take the official photos for their magazine. For the last four years the club has been involved with the Annual Christmas Fair, which raises money for Westmead Hospital by taking Santa photos, printing them up and distributing them to the customers. The Camera Club participates in external competitions as well each year. The club entered its first Federated Camera Club (F.C.C) competition in October, 2005 as a small club. We received 99 points in Large Print with the winning club scoring 109 points. Since then we have done quite well and in 2007 was 1st in Mono-Small Club, 1st in Nature-Small Club and 3re in Small Prints- Open. In 2008 the club was 3rd in Digital-Open. Individual members have also entered Top Shot and have won awards. The club also participates in a yearly challenge with Ryde Eastwood (the Ashes) and a Tri Challenge with Port Hacking and Lane Cove. Each club takes turns in hosting the event. The Camera Club covers numerous interests for members. There are work shops, presentations, competitions, day photo shoots and week-ends away. The first outing was in February, 2006 to the Brewery at Olympic Park, where David showed the members how to take photos at night. Our outings since have included Auburn Gardens, Mardi Gras, Rodeo at Taralga, night shoots, a trip to Taronga Park and many more. We have had week-ends away at Burrawa, Hill End, Menindee Lakes twice and this year to Canberra for the Tulip Festival.